Republicans have settled on their strategy to survive the midterms: lie about their record on pre-existing conditions. The Republicans have been trying to kill coverage for pre-existing conditions under the Affordable Care Act, also known as Obamacare, since the law was passed. But Republicans see the latest polls, and those polls tell them that it’s political suicide to have voters casting ballots knowing that the GOP wants to send us back to the bad old days when a corporate death panel could deny you coverage because you had a cold in ’85. So, they’re taking a play out of Trump’s book and just lying their asses off. Unfortunately for them, they are on record and we have the receipts. Insurers can’t jack up your premiums based on your health history. These provisions are extraordinarily popular. These extraordinarily popular provisions are made possible by the individual mandate. If insurance companies can’t turn down people based on pre-existing conditions or raise a particular person’s premiums due to their health history, they will raise everyone‘s premiums unless they get a lot more healthy people into their customer base. And, if they start raising premiums, healthy people will do the math and not buy insurance, leading to more premium increases, etc. The only way to make this set up work is to require that everyone, healthy or sick, buy health insurance coverage. This was the critical political weakness of the Obamacare bargain: If, hypothetically, you opposed both the popular provisions of the ACA and the unpopular provisions, you only have to succeed at destroying the unpopular portion to crash the whole system. It turns out, the right wing has opposed all of these provisions from the beginning. Not just Republican members of Congress, but the entire think-tank and donor apparatus, from Cato to the Koch Brothers, fought to kill them. When the Republicans offered their so-called alternative to Obamacare in Nov. 2009, it did not include protections for people with pre-existing conditions. In 2011, 26 Republican-controlled states and the NFIB filed a lawsuit that claimed that the entire Affordable Care Act was unconstitutional–including the protections for pre-existing conditions. The Republicans then repealed the tax provisions that formed the core of the individual mandate in the GOP tax scam bill that passed in Dec. 2017, and then, because they were too cowardly to face the voters after repealing the pre-existing conditions protections directly, they had GOP state attorneys general–20 of them!–file a federal lawsuit against the government to kill them instead. (It’s worth noting, however, that 81 Republicans co-sponsored a resolution in 2011 that said essentially the same thing as the lawsuit). The Department of Justice under Trump declined to defend them–in other words, the administration tacitly supports the suit. And, in the meantime, Trump and the Republicans have jammed the judiciary full of judges and judicial nominees who are openly hostile to the ACA and its preexisting conditions protections. Republicans want to kill protections for people with pre-existing conditions. Period. End of story. When they say they don’t, they are lying. That’s all there is too it. Here’s the thing, though: We need to knock these lies down, sure. We need to protect people with pre-existing conditions through the Trump years, fine. But the status quo of the Affordable Care Act isn’t good enough, and it can’t be the north star for progressive health care. 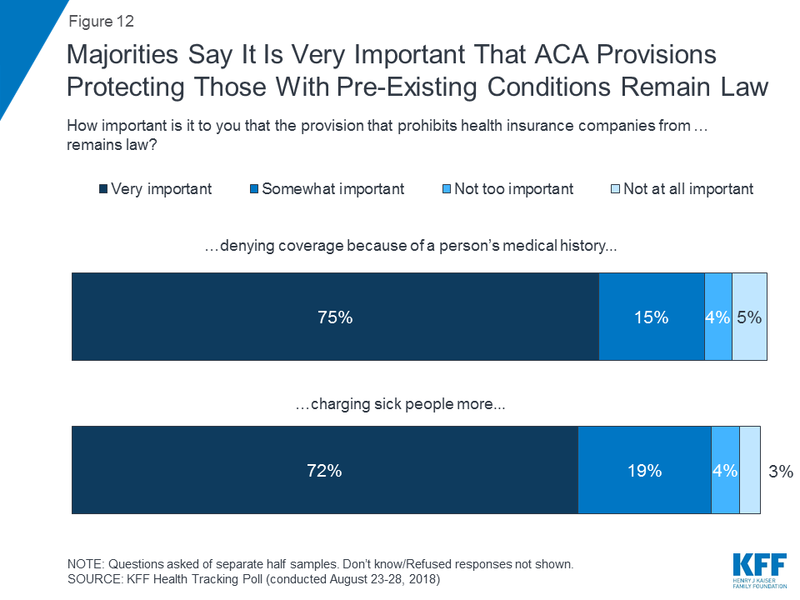 The same percentages of people who support the pre-existing conditions protections support Medicare For All, and in the same breath that Republicans are lying about their attacks on pre-existing conditions, they are lying about Medicare For All. Medicare for All will make health care a right, not a privilege. Not only will it get everyone the health coverage, including vision and dental coverage, that they deserve, but it will do so at a lower cost than we pay now, per person, for health care. And, people who are currently on Medicare will get even more generous benefits. Cue Donald Trump and his ilk saying that Medicare for All will somehow “dismantle” Medicare, and that he is going to keep it “healthy and well” after his administration proposed cutting it by half-a-trillion dollars. Medicare For All is where our political capital and mental energy should be spent from now on. Republicans hate letting people who have pre-existing conditions keep their heads above water. And Trump and the GOP are pathological liars. That’s all there is to it.